What is the relation between natural creativity and artificial intelligence? Artists invite us to discover unexpected relations and reflect on the potential of media art to comprehend urgent cultural and social issues and interpret the complexity of our times. Who are we? Who will we be? What will we become? Using installations, robotic applications, sound art and video art, the artists will involve the audience in an original viewpoint of the world, a fascinating journey through knowledge that will transform us and motivate new behaviour. 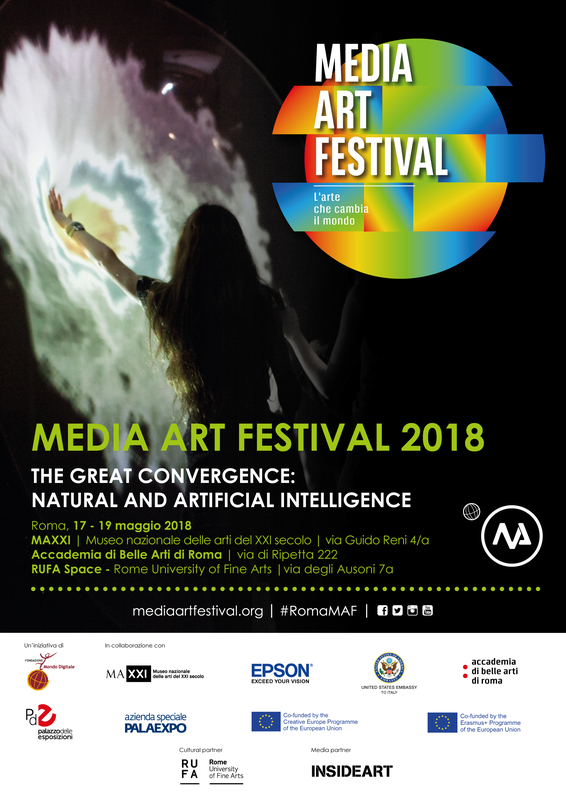 The Media Art Festival 2018 is organised in collaboration with the MAXXI National Museum of 21st Century Art, Epson, the United States Embassy in Italy, the Rome Accademia delle Belle Arti and the Palazzo delle Esposizioni. RUFA – Rome University of Fine Arts is our cultural partner, while Inside Art is the media partner. The Festival is held in connection with the Europa Creativa and Erasmus+ Programmes.